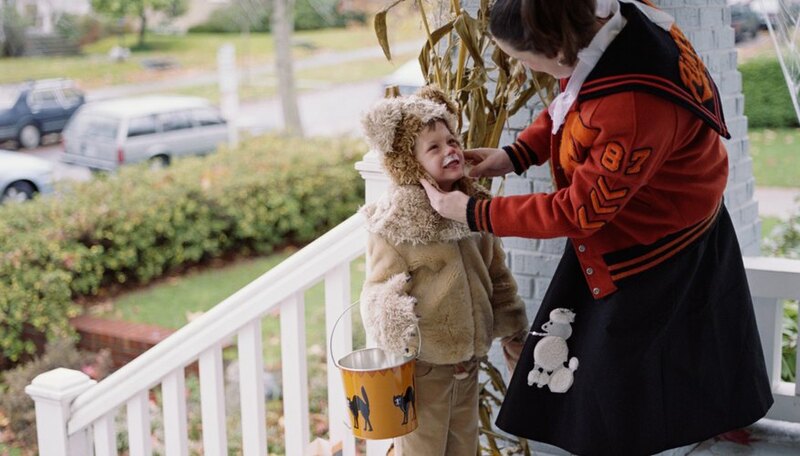 You don't need to be an expert seamstress to make yourself or your child into a cute and lovable teddy bear for Halloween or for your next costume party. With a little creativity you can easily turn everyday accessories into bear flare -- like ears, tails and fur. You can be a special teddy bear from your childhood or bring to life a popular, well-known bear from cartoons or children's literature. Find a hooded sweatshirt in a perfect "bear" brown or tan. Sew on simple ears and fur around the neck, hood and sleeves. A soft velour hoodie with matching pants and brown gloves will be charming once construction paper paws and claws are added. If your favorite teddy is plump, stuff your hoodie with a pillow bear belly. To finish off your simple and warm bear costume, give your hoodie a bright-colored bow that you can attach to the zipper. You can make a bear mask with your child using construction paper or a paper plate. Paint it or use markers to create a bear face. Don't forget to give it ears -- perhaps even some brown fur -- and make it wearable by attaching a string to the sides of the mask with staples. A plain headband with glued-on ears can be used above a painted-on bear face. You won't need much to make a warm and cuddly teddy bear costume for your baby -- just a brown one-piece pajama and a brown baby beanie hat. Add ears to the beanie hat by sewing on ear-shaped fabric, felt or construction paper. Don't forget to put a fluffy tail on the back of the pajamas. Or make your baby into a Care Bear by dressing her in a colorful one-piece pajama with matching ears and a simple design painted on the belly such as a heart or rainbow. In order to dress up like your favorite teddy bear, you need nothing more than his signature clothes. For Winnie the Pooh, put on a tight, long-sleeved yellow shirt and leggings, and a red-collared shirt. Find some soft green overalls to bring Corduroy to life. Yogi Bear would need only brown pants and a sweatshirt with a white-collared shirt underneath and a green tie and hat. Sister Berenstain can be brought to life with pink overalls and a pink polka-dot shirt. You could even go as Po, the Kung Fu Panda! Based in Paris, France, Marianne Descott has been writing since 2002. Covering subjects such as parenting and travel, she has been published in "Lonely Planet" and "Get Born" magazine. She also regularly blogs on living abroad and international issues. Descott has a Bachelor of Arts in social sciences.